My husband calls me the “Queen of Clean” and also the “Unhoarder.” Both titles I am very proud of and try to live up to. 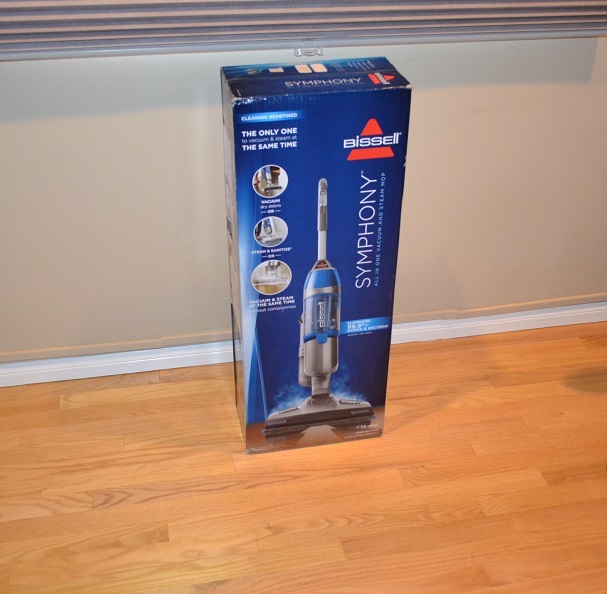 You can imagine how pleased I was when I received the new BISSELL Symphony All in One Vacuum and Steam Mop to use and review. I have a combination of hardwood, tile and stone floors in my house and this seemed like it would be an answer to my prayers in helping me speed up the process of keeping those surfaces clean. I have to admit that when I read that this vacuum steam cleaned and vacuumed at the same time, I was a little skeptical. To my knowledge (and trust me, I have researched and made a systematic list of every vacuum cleaner out there) this is the only cleaner that can vacuum and steam at the same time. When I finished putting this BISSELL Symphony All in One Vacuum and Steam Mop through its paces, I had no doubts left in my mind. Included in the box is one Symphony™ All in One Vacuum and Steam Mop, 4 Microfiber mop pads (2 soft, 2 scrubby), 1 Water Filter and 1 Water Cup. Also included in the box is a 2-year limited warranty registration card! I got right to work, as any good “Queen of Clean” would and quickly assembled the vacuum. It comes in two pieces and clicks easily together. It is very lightweight and so easy to use because it features Easy Touch Digital Controls™, a 5-way adjustable handle, and a Quick-Release Mop Pad Tray™. It also has well placed directions on the side of the machine for easy review. This is a great feature, especially if you are one who tends to misplace the instructions booklet ( aka throwing it away with the box). 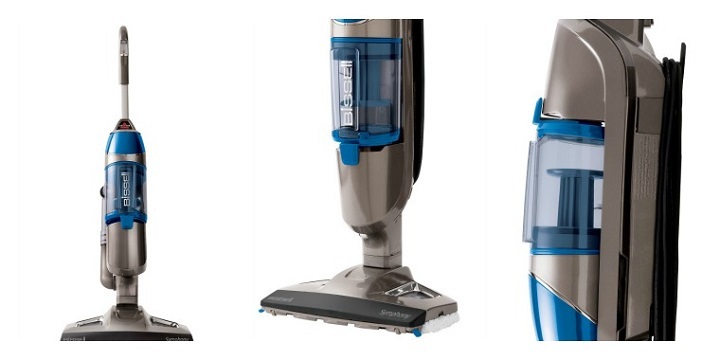 There are three ways to use this vacuum to clean — vacuum or steam separately or use both at the same time. I tried all three and was quite impressed. The steam mop is ready to clean in approximately 30 seconds and you will hear a knocking sound as it heats up. When the indicator light on the front of the unit comes on, you’re ready to clean. It easily cleaned all my hard floors with the vacuum and steam at the same time, in one easy motion. The Easy Touch Digital Controls let you switch between functions while cleaning so you can vacuum and steam at the same time or separately to match the right clean to the right situation. My hardwood floors are all sealed so I had no issues. Steam is not recommended for use on unsealed wood floors. It is best to test in an inconspicuous area and check the care instructions from your flooring manufacturer. I was able to save time by skipping the broom, dustpan, dirty mop and bucket. I also did not use any harsh chemicals on my floor. By holding the steam mop in place for 15–20 seconds, you can sanitize your floors by killing germs such as E. coli and salmonella. The BISSELL Symphony All in One Vacuum and Steam Mop is really special thanks to its innovative design that utilizes a powerful cyclonic action vacuum. It easily picked up both my fine and large debris and left my floors barefoot-clean. I would most definitely recommend this product for its cleaning power and because it saves you time by vacuuming and steaming at the same time. This “Queen of Clean” is smitten with this product and will be using it as her go to floor cleaner from now on. This product just came out on 4/13/14 and is available at your local Best Buy store or online at Best Buy for a retail value of $219.99. Plus thru 5/3/2014 you can use promo code BISSELLSYMPHONY at checkout to receive a Free pack of Mop Pads. Along with a 5-way adjustable handle and Quick-Release Mop Pad Tray enable simple operation. Dry Tank Technology – Helps keep your tank from getting wet while you steam. Include 2 soft pads for everyday cleaning and 2 scrubby pads for tough messes. Lightweight design – Makes the vacuum easy to maneuver and transport from room to room. Pleated cyclonic filter – Helps maintain a healthy environment. 25′ cord – Lets you clean a large area before changing outlets. 3.3 amps of power -To thoroughly clean bare floors. With bagless technology cleans away fine and large debris. 11″ cleaning path -Lets you cover a wide swath of flooring with every pass. 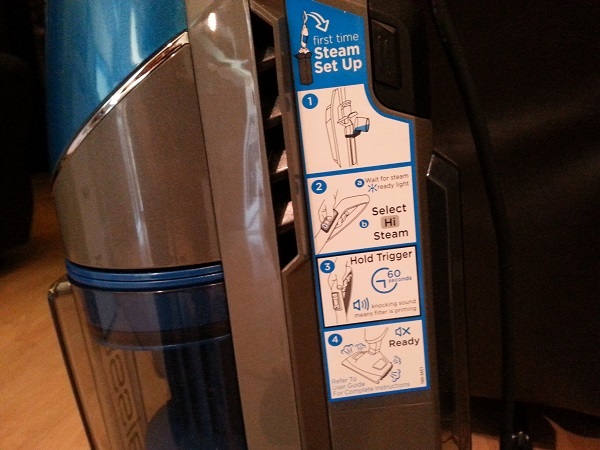 3 ways to clean -So you can vacuum and steam separately or do both at the same time. Kind of makes me want to put in hardwood flooring and be done with the carpeting. Looks like a good deal. We have hardwood too, and skates, and PETS, so we could really put something this to good use. I love Bissel products. I really like Bissel products too. I have spent way more on’fancier’ cleaners and they didn’t work better than Bissel and frequently worked worse! I LOVE the idea of this 3in1 product. Quicker, better for the enviroment and actually a more effective cleaner?! I’m sold. Thanks for the tip, Queen of Clean. I think I may be visiting Best Buy soon! With all males in my house, my floors are filthy, so I think something like this would clean better than what I have now. I would love to give one a try! What a great mop. I really like the whole idea of steam mopping it seems to be a better way of cleaning. I am completely in love with this mop! Like Seriously in love with it! It saves me so much time not having to sweep up all the dog and cat hair before I clean the floors. And the house we are moving to; has a lot more tile flooring! So it will save me even more time in that house! I love it! Having a steam mop at home makes such a big difference when it comes to really getting everything clean. It also saves you a lot of money on hiring people to come and clean your floors and carpet for you. Our piece-of-crap Shark gave out in less than 6 months and we are looking for a new option. Will go check this one out. Ohh I have had a Shark for a long time but this looks fantastic! I’m going to get one for the first floor and move the Shark upstairs for occasional use! I need to look into purchasing one of these. If it works half as good as it did for you, I NEED it! I love Bissell products; I didn’t know they had a new steam mop. I should look into this, would make a good housewarming gift for a friend. I need to get one of these! I have seen one in action and I think it’s a necessity for my floors. Thanks for the code! This is just right as I am looking for a new vacuum to purchase. 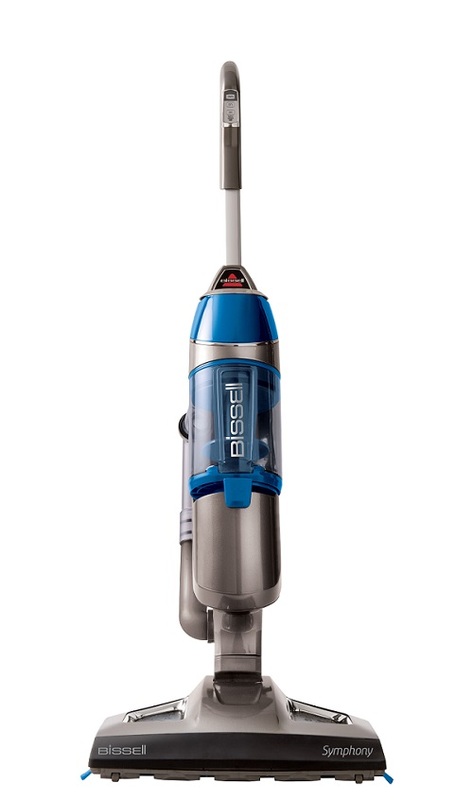 I have been wanting a steam mop for so long, I am a big fan of Bissell so I will definitely be checking this one out. I could really use a steam mop. My kitchen floor could go for a good cleaning. That’s pretty awesome actually. I love this one! The easy touch digital controls are a big thing. I hate trying to clean something and have to stop and try to get the control in the right spot. My kitchen could sure use this. This is a great deal, I would love to pick up a new wet vac for my kitchen, this would work great on the hard wood floor,. What a great deal. Bissell is a great brand that I can stand behind. I have an older steam mop which I believe is Bissell and I love it. It gets everything so clean! I can’t live without my steam mop and I’ll probably need a new one soon! I will check out this one! I currently have a Bissell vacuum cleaner and I love it! So I know this one is good too. Being able to vacuum at the same time is awesome. I Have hardwood, tile and linoleum in the house. I’ve never heard of a steam mop before, just a steam vacuum. I love the clean that my steam vacuum gives me so this would be great for all the hardwood I have in the kitchen and dining room. Love these mops! I have two different versions but I think Bissell is my favorite brand. I’ve heard of this before but haven’t seen them in our market. But it does looks easier than the normal mopping! I just recently tried my first Bissell and am hooked. This looks really nice! Love steam mops! They are my favorite way to clean the floor. However my sister just “Borrowed” mine. Guess I will need a new one. What??!!! I have I head over to bestbuy and pick one up. I am so over the one that we do have. This seems pretty nice and sleek. Looks like a great vacuum! Checking them out! I bet this would be perfect for me. With two dogs and a toddler… I have a lot to vacuum! Oh, I’d love to try this! My floors are always a mess! I so need this cleaner! I have a combination of carpet and hardwood floors and this seems like the perfect product! I really like how you can switch functions so easily. I am liking this!! I have always been happy with Bissell products, and am sure this would be no exception. I was wondering if I should get one of these. Thanks for your thorough review. I think its a great investment. That looks so fun to use! I would love to see before and after pics! I would love to give this a try on my tile floor. My kitchen could use this thing. I’ll show this to my husband and see what he thinks! Oh I need something like this for our kitchen. I have heard great things about steam mops! I love steam mops and I actually need a new one! I’ve always had luck with Bissell products in the past, I’ll have to check this out! Gotta look into purchasing one of these. My kitchen totally needs this. Thanks!